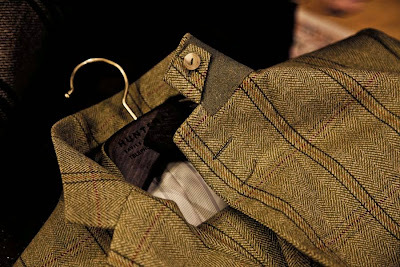 This marks the beginning of a new series of posts tracking the making of a Huntsman tweed shooting suit. A three-piece with plus-twos in one of this year’s house tweeds (above, right, and second from the left on the sleeves). 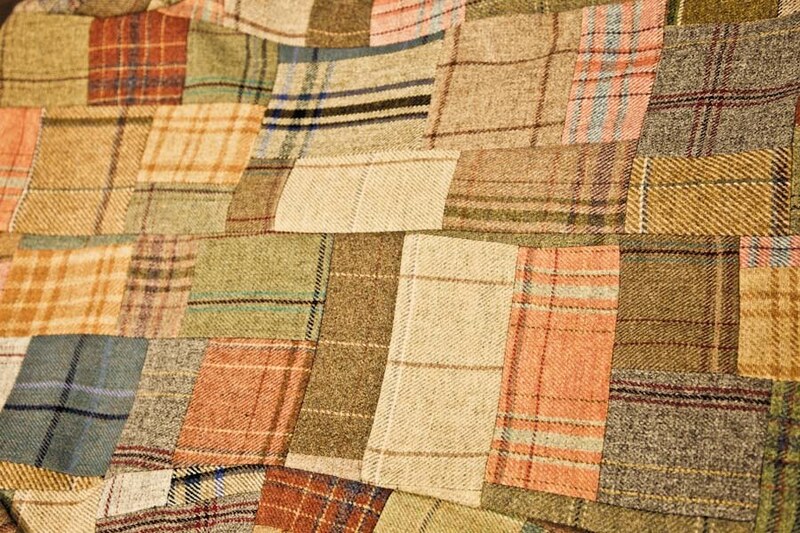 The pattern for the collection is taken from the old design, as are the colours for one tweed, while the background colours for the rest are standard browns, lovat, biscuit etc. The precise colour combinations are chosen by Hunstman staff (and occasionally clients) when they receive a large blanket from the mill covering 50-odd swatches (this series will feature a post on the new blanket when it arrives later in the year). The mill receives guidance from general manager Peter Smith and his team. In the current collection, for example, Peter suggested a lot of lilac in the green tweed you can see on the model above. 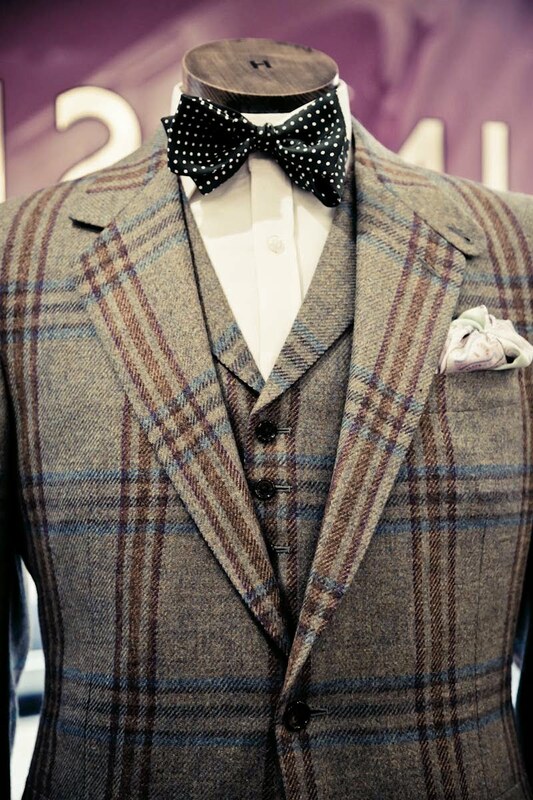 Despite that, and the rather unusual shade of blue, this tweed was one of the first to sell out. 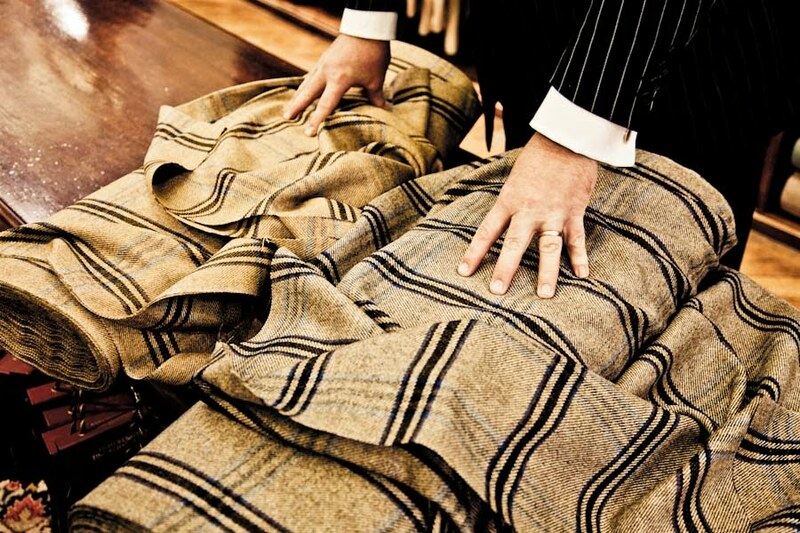 Then again, to retain their uniqueness only 60 metres of the tweeds are ordered each time – since some customers order a shooting suit with both plus-twos and trousers, that 60 metres doesn’t go very far. To publicise the tweeds this year, Huntsman made up the lovely patched jacket you can see below, featuring tweeds from the 1960s to the present. Although it was only a showpiece for the window, they ended up selling four of the jackets – though some customers requested a little less pink here, a bit more blue there. It takes the idea of commissioning cloth to a whole new level. The 2011/12 tweeds will revive the pattern from 1977 – the yellow with large twill you can see on the far right, centre, on the jacket above. Above that is a brown tweed with red check from 2001, to its left is a pink from 2004, going left still is a sparse check from 2008 and next to that is the 1968/2010 check with horizontal brown stripe I am having made. There is also an 1980s check there, the orange and cream on the far left, centre. And below that is a grey check from 1999. It’s interesting to see how patterns and colours change over time, from the simple to the variegated, and which ones are considered suitable for the present day. Fashions come full circle. 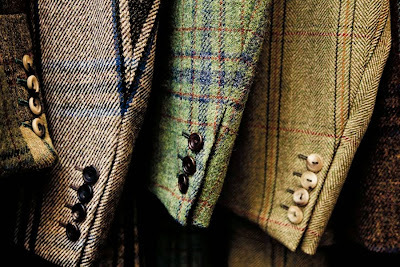 I’m pleased with my tweed – I think the browns and blues will make it easy to wear casually with jeans or cords. And the brown background is slightly more modern than the greens or biscuit. 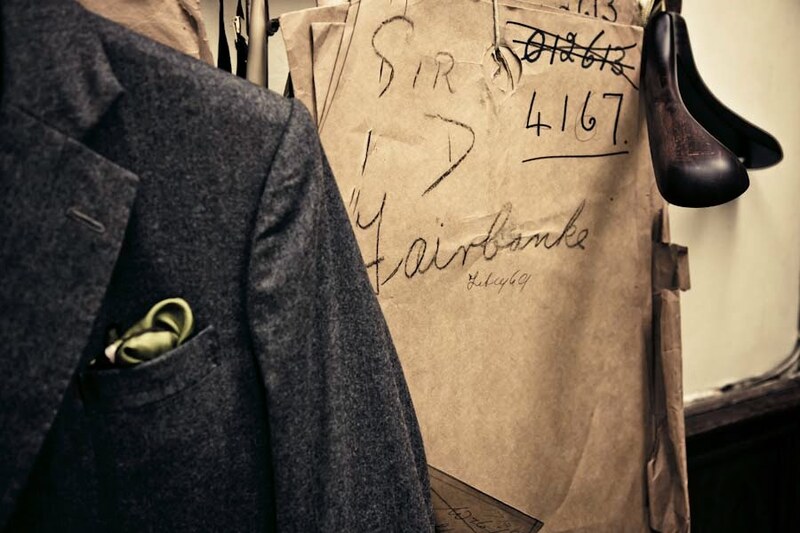 You can follow the discussion on Huntsman tweed suit: Part 1 by entering your email address in the box below. You will then receive an email every time a new comment is added. These will also contain a link to a page where you can stop the alerts, and remove all of your related data from the site. Simon, any chance to see full photo of the jacket from the bottom picture? You made a stunning choice! 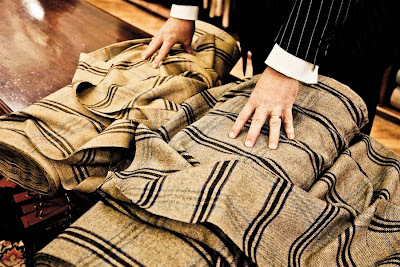 The ultra bold black verticals on a warm complex neutral is the most eye-popping of all tweeds shown. I can’t wait to see what is done with that pattern as it becomes incorporated into the cut of jacket. Sure as hell won’t be easy to work with. That’s where tailoring artistry (genius?) shows its stuff. What potential for a brilliant outcome! As for patchwork anything: Interesting collection of patterns, but PLEASE!!! Leave it home the closet! Strictly a novelty. 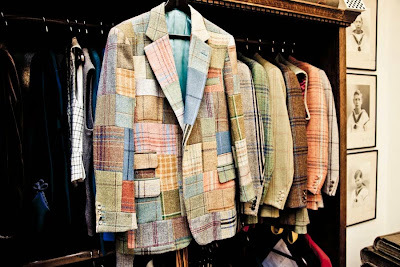 I’ve always hated that stuff — from Brooks Brothers yuppy madras to Ralph Lauren’s patchwork, echhhh! Great photos. Can’t wait to see how this develops. 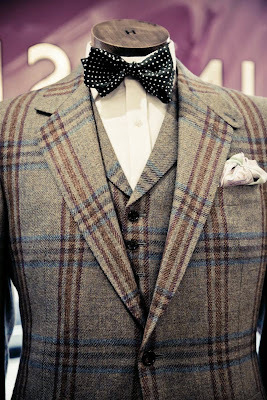 The next post, on Monday, will show more pictures of the suit at the bottom, as this is the style I am emulating. And it’s a jacket rather than a field coat. The patch work jacket, what color pants would best match the jacket? With so many colors, would a dark brown work? Just curious, I dont have or will buy a jacket like that.. Anything plain that echoed some of those autumnal colours. Yes, a dark brown moleskin perhaps, or grey flannels.